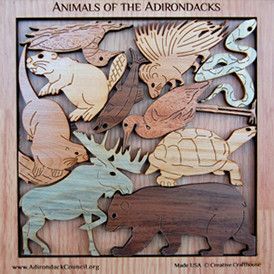 Challenging wooden jigsaw puzzle and brain teaser features 10 animals native to the Adirondacks. Animals included are a Loon, Porcupine, Snake, Beaver, Otter, Heron, Turtle, Moose, Black Bear. Puzzle pieces are laser cut from 1/4" thick hardwoods, with at least 4 different woods in each puzzle. Puzzle measures 7" x 7" in frame.